Charlie McGettigan with Gary Ferguson, Janet Holmes and Colin Henry. 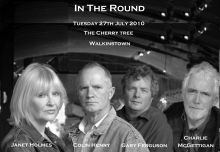 Down Through the years Charlie McGettigan has worked with artists including De Dannan, Mary and Frances Black, Ray Lynam, Hal Ketchum, Maura O Connell and Eleanor Shanley who have recorded many of Charlie’s songs including 'Feet of a Dancer', 'A Bed for the Night', 'If Anything Happened to You' and others. Charlie's special guests will include U.S. based Songwriter, Gary Ferguson and Belfast native Janet Holmes with guitarist, Colin Henry. Highly recommended. Book early! Gary Ferguson from Pennsylvania, USA is an award winning singer, songwriter and musician. He wrote his first song in 1969 while living in Texas and since then has gone on to write many songs which have been recorded by both himself and many other Bluegrass artists. He has had two #2 songs on the "Bluegrass Unlimited Top 30" and 3 of his songs were in BU’s Top 200 Songs of the 1990's. His song "Last Day at Gettysburg" was not only a big hit for Larry Sparks, but has also become somewhat of a "Bluegrass Classic" and can often be heard around campfires at Bluegrass festivals. Janet Holmes’ first album ‘The Road to the West’ in 2004 was a great success.This first album largely consisted of cover versions of other writers’ pieces with only one song written by Janet herself. Colin Henry- Hailing from North Antrim, Northern Ireland Colin was brought up on the late night music sessions in his family hotel. Not the familiar trad or bluegrass sessions, however, but around the piano playing and singing swing, jazz, show tunes and the occasional Irish ballad. His first performance at the age of 15 was playing ‘ Down by the Riverside’ on tenor banjo at a Saturday night dinner dance in the hotel. He has been playing and performing ever since.